Most people believe that the history of geothermal energy is relatively short. This is a common misconception. While the full story of humankind's first harnessing of geothermal energy is truly lost in antiquity, it is clear that the history of geothermal energy goes back as far as that of our other alternative energy sources. The ancient Romans used hot springs to heat their baths and homes. This “magic water” was also used for medicinal and cooking purposes. Archeological evidence shows that the first human use of geothermal resources occurred more than 10,000 years ago in North America, with the settlement of Paleo-Indians around hot springs. In fact hot springs seem to have been one of our earliest luxuries. Wherever in the world hot water came to the surface, we have used it for remedial bathing. The first known commercial use of geothermal energy in the United States occurred in Hot Springs, Arkansas in 1830. Asa Thompson charged one dollar each for the use of three spring-fed baths. A hotel in Oregon USA used geothermal energy from underground hot springs to heat rooms in 1864. The first industrial use of geothermal energy began near Pisa, Italy in the late 19th century. Steam coming from natural vents (and from drilled holes) was used to extract boric acid from the hot pools that are now known as the Larderello fields. It was not until the start of the 20th century that geothermal power was used to make electricity. 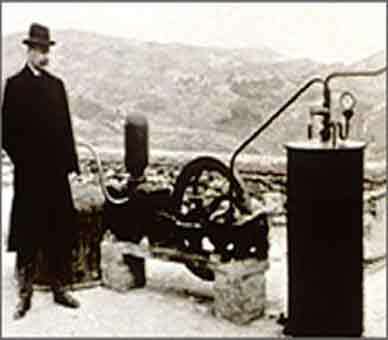 In 1904 Prince Piero Conti, owner of the Larderello fields, ended a long-standing dispute with the local electricity company and attached a generator to a natural-steam-driven engine. It was a small generator which only lit four light bulbs - but the first of its kind none the less! This experiment led to the installation of the worlds first geothermal power plant, in 1911, with a capacity of 250 kilowatts. By 1975 the Larderello fields were capable of producing 405 megawatts of power. It was the world's only industrial producer of geothermal electricity until 1958, when New Zealand built a plant in Wairakei. The Geysers Resort Hotel, California, was the site of the first geothermal power plant in the United States. It was built in 1922 by John D. Grant, and was capable of generating enough electricity to light the entire resort. It ceased operation when cheaper power sources became available. In 1960, Pacific Gas and Electric began operation of the first successful geothermal power plant in the United States at The Geysers. The largest group of geothermal power plants in the world - 21 in total - are now located at The Geysers in California. The original turbine installed at The Geysers, lasted for more than 30 years, and produced 11 Megawatts of power. The Geysers are currently owned by the Calpine corporation and the Northern California Power agency. It currently produces over 750 Megawatts of power. The 1950's saw the production of the first "water source" heat pumps designed for residential applications. In the early 1960's the water source heat pump was introduced into commercial and institutional applications. By the 1980's, early versions of the geothermal heat pumps (GHP) we use today evolved from the water source heat pump industry. GHP's are rapidly growing in popularity, and GHP technology continues to evolve to this day. Today, 69 geothermal power facilities are in operation at 18 sites around the United States, and geothermal power is generated in over 20 countries around the world. Geothermal power supplies less than 1% of the world's energy in 2008 - however by 2050 it is anticipated that geothermal power will meet between 10-20% of the worlds energy requirements. This suggests that the most exciting advances in the history of geothermal energy are still to come.